In his now classic book The Tyranny of Distance, first published in 1966, Geoffrey Blainey asked his readers: ‘Were aircraft ever as miraculous as the first Australian mail steamers which were faster than any other form of passenger transport and carried the latest news as well? Did aircraft shape the lives of Australians more than the network of railways in the nineteenth century? Were aircraft in their first half century ever as miraculous as the international telegraph which conveyed messages and news faster in the 1870s than the latest aircraft can carry them?’. [i] For Blainey, the answer to all these questions was a vaguely qualified no. This perhaps explains why he only devoted 7 of the 365 pages of his book to the rise of aircraft. Many, however, would disagree with his assessment. The Tyranny of Distance is essentially a work about the nineteenth century. In terms of modern inventions, it concentrates on the first surge of change in Australia brought about by railways, steamships and the telegraph. The rise of civil aviation was part of the next phase of technological innovation which occurred in the late nineteenth and early twentieth century primarily around the development of aircraft, cars and radio. Other services followed. The Aerial Medical Service, operating at the top end of the Northern Territory, was set up in 1943. Established in 1924, the Royal Far West Children’s Home developed an aerial transport service in the 1930s and lobbied the NSW government to construct airstrips. Nancy Bird-Walton was employed to run this aerial scheme in 1935. [vii] Angel Flight, an Australia charity that provides health care, was established it April 2003. Its founder, Bill Bristow, was awarded a Member of the Order of Australia in 2009 for services to rural and remote communities. Isolation by definition is hard to represent through physical items; photographs and personal accounts provide a more direct path of access to this story. Collections of this type at the NMA, the NLA and the major state archive collections are potential sources. There is undoubtedly more important privately owned material still to be identified and collected. 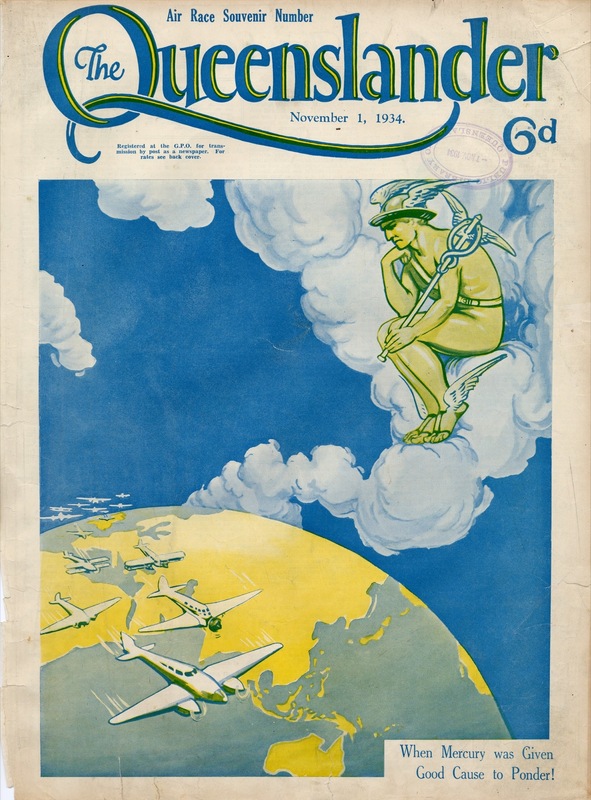 It is also reasonable to view items associated with the 1919-20 air race as part of this story, in that the race was held to establish direct and rapid aerial communication on a route where sea travel took weeks or months. The Australian War Memorial (AWM) holds a DH9 aircraft that completed the gruelling trip, and the winning Vickers Vimy is preserved in an individual case at Adelaide Airport. The work of the RFDS is also relevant to this theme and is represented in a range of state and local collections. Material relevant to this theme that is held within established collecting institutions is mostly both accessible and well cared for. It is anticipated that many privately held items will be found through the course of this research which may be vulnerable to loss. DH9 aircraft used in the 1919 -1920 air race. A collection material relating to John Flynn, the founder of the Royal Flying Doctors Service. These include documents and oral histories from John Flynn and the people who knew him. Documents and records that are related to E J Conellan and Conellan Airways. These include contracts, lease agreements and aerial surveys. A collection of photographs, documents and ephemera that relates to airlines that connected regional centres such as MacRobertson Millers and Qantas. The NLA also has material relating to the delivery of airmail to isolated communities. Jan Phillips Collection contains items from the East West Airlines, a regional airline that serviced regional centres and major cities. This collection contains uniforms, photographs and East – West magazines. Australia Post Historical Collection contains material from Australia Post dating from the late 19th century. These include mail bags that were used to deliver mail through Qantas to remote and isolated communities. A regional airline that helped provide services to local communities in the region. This museum is dedicated to Cecil Arthur Butler and the airline he created. A regional centre and major airhub since the early 20th century. The Qantas Heritage Collection contains material from when it began as a regional airline and then as part of Qantas Empire Airways. Situated in the hangar where Conellan Airways began, the museum houses several historic aircraft and memorabilia relating to Conellan, Royal Flying Doctors and aviation in the Northern Territory. Contains a gallery that showcases development and history of the Royal Flying Doctor’s Service and aviation in regional Queensland. Is a museum devoted to Qantas and its development. Has material relating to Qantas early years servicing regional Queensland through airmail services and the first inaugural flight of the RFDS. A major regional air hub that was part of the war and also serviced civilian aircraft. The Nhill Aviation Heritage Centre is dedicated to Nhill part in early aviation and its continued use as a recreational aerodrome. The heritage centre also encompasses the Nhill Aeradio Station. An isolated refuelling point in the Cocos Keeling Islands, this site was often used in the early days of aviation by aircraft on their way to South Asia. The base of operations for Butler Air Transport which provided services to regional communities in NSW. Hangar where Sir Reginald Ansett started his transport company which was important to the development of Hamilton as a regional aviation hub. Listed on the WA Heritage list, this site represents the role of the flying doctors in the Kimberly communities by providing medical services to remote areas. Conellan Airways began as a mail carrier for the Northern Territory and Western Australia, connecting Alice Springs and Wyndham. It then became a carrier for the Royal Flying Doctor’s Service and eventually becoming a regional airline. Material regarding Connellan Airways can be found in the National Library of Australia, National Archives of Australia and the Central Australian Aviation Museum. One of the oldest continuing airlines in Australia which started out as a regional air mail carrier to become an international airline, helping to connect isolated communities. Qantas material can be found in numerous places such as the National Museum of Australia, the National Library of Australia and the Qantas Founders Outback Museum. Qantas is also associated with several sites that deal with the isolation such as the Qantas hut in the Cocos Keeling Island. [i] Geoffrey Blainey, The Tyrany of Distance, Sun Books, Melbourne, 1977, p304. [ii] Hudson Fysh, Wings to the World, Angus and Robertson, Sydney 1970, p169. [iii]Argus, 24 October 1934, cited in Graeme Davison, The Unforgiving Minute: How Australians Learned to Tell the Time, Oxford University Press, Melbourne, 1993, p102. [v] Ernestine Hill, Flying Doctor Calling: The Flying Doctor Service of Australia, Angus and Robertson, London, 1947, p23. [vi] Jill Barclay, ‘The Royal Flying Doctor Service in Australia: the nurses’ story’, Oral History Association of Australia Journal, no 20, 1998, p52. [vii] Nancy Bird-Walton, My God! It's a women: the autobiography of Nancy Bird, Angus and Robertson, North Ryde, 1990. [viii] Wray Vamplew (ed), Australians: Historical Statistics, Fairfax, Syme and Weldon Associates, Sydney, 1987, p181.